Images contain information about the spatial properties of the scene they depict. When coupled with suitable assumptions, images can be used to infer thr- dimensional information. For instance, if the scene contains objects made with homogeneous material, such as marble, variations in image intensity can be - sociated with variations in shape, and hence the "e;shading"e; in the image can b… e exploited to infer the "e;shape"e; of the scene (shape from shading). Similarly, if the scene contains (statistically) regular structures, variations in image intensity can be used to infer shape (shape from textures). Shading, texture, cast shadows, - cluding boundaries are all "e;cues"e; that can be exploited to infer spatial properties of the scene from a single image, when the underlying assumptions are sat- ?ed. In addition, one can obtain spatial cues from multiple images of the same scene taken with changing conditions. For instance, changes in the image due to a moving light source are used in "e;photometric stereo,"e; changes in the image due to changes in the position of the cameras are used in "e;stereo,"e; "e;structure from motion,"e; and "e;motion blur. 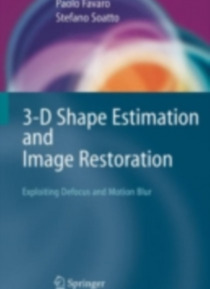 "e; Finally, changes in the image due to changes in the geometry of the camera are used in "e;shape from defocus. "e; In this book, we will concentrate on the latter two approaches, motion blur and defocus, which are referred to collectively as "e;accommodation cues.